How do you know how far you have walked? There are several ways to measure your walking distance, with more available than ever before thanks to mobile apps, GPS, and computer mapping. The best one to use will depend on whether you are walking outdoors or indoors and how you are using that information. In the ancient past (just a few years ago) you needed a special GPS unit to measure walking distance via satellite technology. But now GPS is built into your smartphone and is used by walking apps that can track your speed and distance, such as MapMyWalk. It couldn't be more convenient, since it's likely you're bringing your phone along on your walk. Besides knowing how far you've walked, you can also see the route you've taken, which can help you navigate back to where you started. 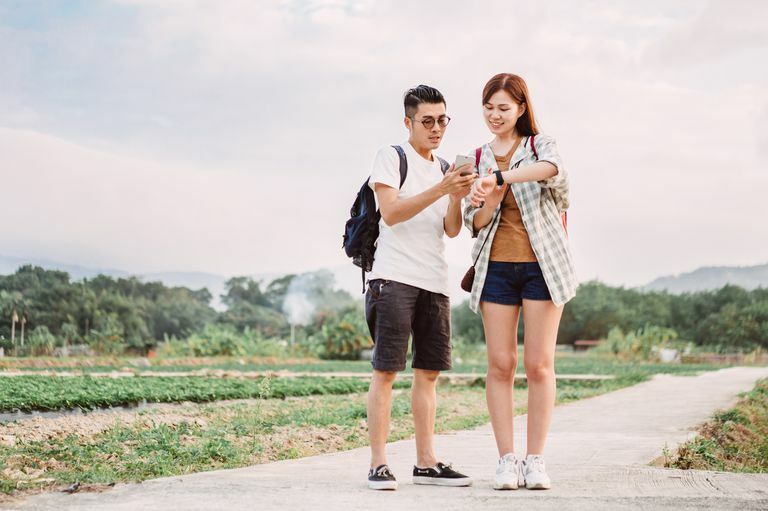 Many smart pedometers and fitness bands, such as Fitbit, are linked to apps that have an exercise-tracking function that will use the phone's GPS to map and measure your walk. Besides measuring total distance, you often can review your route on a map, and some apps allow you to save and use the same route again. For better distance accuracy, you can walk the same route several times and compare the distance each time. The accuracy of the GPS distance measurement depends on several factors. Phone GPS measurements tend to be off by as much as 10 percent. This is because you phone must have frequent communication with multiple GPS satellites in the sky. If your phone doesn't have a clear view of the sky, it won't be locking position with as many satellites. If your phone loses contact with one or more satellites, you can see a sudden jump in distance. If you look at your route as plotted on a map, you can see this "GPS jitter" and the errors it introduces. If you are walking in an area with many tall buildings, in a deep valley, or next to a hill, you may see more GPS inaccuracy and loss of signal. Plus, GPS is often lost and doesn't work well indoors. It won't measure your distance on the treadmill because your position isn't changing. Garmin, Tom Tom, and others make GPS watches for runners and cyclists that also work for walkers. These often display both your speed and distance and may link with heart rate monitor straps or have LED pulse detection built in. They may be more convenient for checking on the fly compared to your mobile phone app, but they are fairly expensive. They have the same drawbacks as your mobile phone GPS for losing contact with the satellites and not working indoors. More and more smartwatches and fitness bands are incorporating GPS for distance and speed readings as well, such as the Apple Watch 2 (and later models) and Fitbit Ionic or Surge. These allow you to leave your smartphone behind during your walking workout and still get GPS speed and distance measurements. Using MapMyWalk online, you can create and measure a walking route. The website allows you to draw the routes and get a distance reading. MapMyWalk has both street view and satellite view. You can zoom in on portions of the route that use a sidewalk or path that isn't along a street. With a premium subscription, you can print out maps and directions and export them to your phone app to use while walking. You can drive a walking route in a car or on a bike with an odometer and measure it that way. The distance may be off depending on whether your odometer is properly calibrated for your tire size and other factors. The gold standard for walking events and running races is to use a mechanical wheel that clicks off each yard or meter. Pedometer and fitness band steps are translated into a distance measurement based on your stride length. Many pedometers ask you to measure your stride length and enter it into your user profile, then it automatically calculates the distance you walk. For this to be reliable, you need to have a very consistent stride. It's wise to use the pedometer distance reading only to get an estimate and not to rely on it as an official reading. If your pedometer doesn't calculate steps to distance for you, there are charts to convert steps into miles and kilometers.